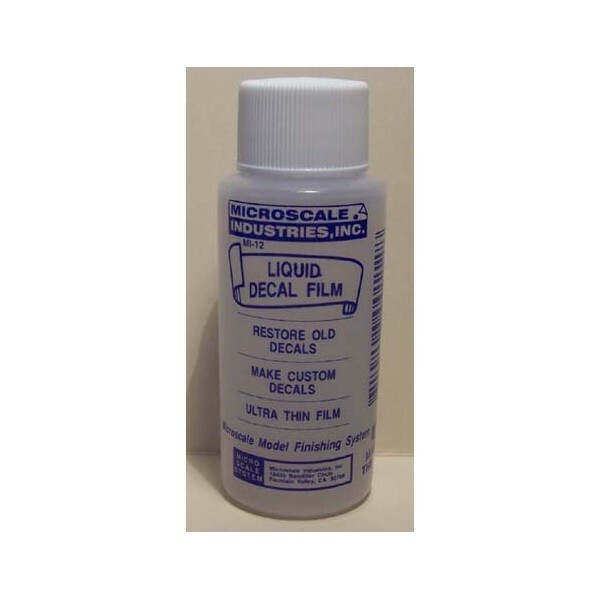 Everyone should have Micro Liquid Decal Film who models and uses decals. Especially if you have been at it for some time. 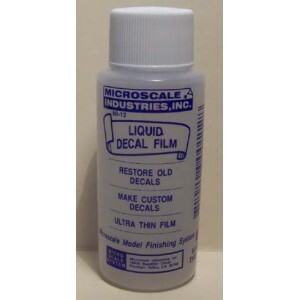 Everyone should have Micro Liquid Decal Film who models and uses decals. Especially if you have been at it for some time. The typical decal scrap box is not the best place to store decals. Exposed to air, sunlight, and moisture, great swings of temperature or general abuse, and decals will go bad. Or maybe you just always had trouble putting on thin stripes. Micro Liquid Decal Film solves all of those problems and makes a decal which for whatever reason is bad, work again just like new almost immediately. Of course if you have already put it in water it is too late. So if you have some old decals you really have to use, coat them with Micro Liquid Decal Film to be sure. Or if there is any indication that you might have a problem, don't take a chance, you can solve the problem on the spot. Simply take a small brush and coat the image on the decal you want to use. Allow to dry for 20 minutes. Apply the decal as usual. It's that simple. But that is just the beginning, if you want to make a decal of your own design, all you need is some decal paper. The unused margins of some decals you have will do. You can use ink, paint, dry transfers to make a design. Then coat with Micro Liquid Decal Film, and you may be surprised at how well you can do. It is a lot easier to do 'art work' on a flat surface than directly on a model.